Over that past year and a half, Google has made several big changes to its search engine ranking algorithm. These changes have had a significant impact on the Google rankings of thousands of websites. This has left many in our industry, including the experts, scratching their heads, wondering which factors have changed. As a result, our industry has become overwhelmed with rumor and speculation. Often the internet marketing advice we hear is not substantiated with any empirical evidence. This is of course the cause of much of the rumor and speculation. We know there are many great companies out there that use good science and sound logic to direct their internet marketing strategies, but in our experience, there are still a lot of firms that don’t – too many rely solely on gut instinct and hunches. We hope that by publishing our recent findings we can help to dispel many of the rumors that have been circulating and create a real awareness of Google’s most recent changes. These are the ten factors from our study that showed the highest correlation to ranking well on Google. 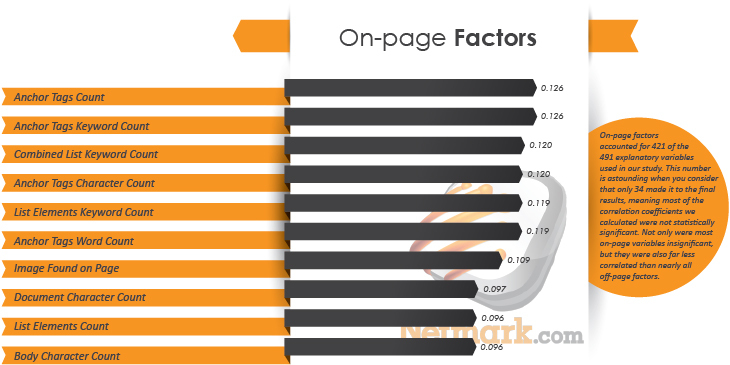 We were a bit surprised to find that off-page factors still had a much higher correlation to rankings on Google than on-page factors. In addition, it was interesting to see that even with Google’s EMD update, an exact match domain to the search query is still the factor that has the highest correlation with rankings. It’s common practice in statistics to use the Spearman rho to measure the correlation coefficient between ordinal values and rankings; however, this is not true when it comes to dichotomous variables and rankings. For dichotomous variables, statisticians primarily use a method called “Rank-Biserial.” This method is used when one variable is ordinal or rankings, and the second is dichotomous (meaning it’s either 0 or 1, yes or no, etc.). The Spearman rho was not designed to measure the correlation coefficient of rankings and dichotomous data. For this reason, we chose not to use this method for our dichotomous variables (please refer to our methodology where this is explained). This is where the difference between our study and others that have been done previously is manifested. Other correlational studies we’ve seen use the Spearman rho to measure the correlation between “EMD” and rankings. This results in a correlation coefficient that’s different from ours, and also less accurate. For fun, we also measured the correlation coefficient of “EMD” using the Spearman rho, but did not report our findings. The result we got was a correlation coefficient of 0.1493. If you compare this number to other correlational studies done previously on “EMD,” you can see that the correlation is weaker now than in the past. However, had other firms analyzed their dichotomous data using the “Rank-Biserial” method, you probably would have seen much higher correlation coefficients than what they were able to report. Our gut instinct has been telling us for some time that social media factors have become much more important to rankings. This study proves it. As you can see here, Google +1s for the page have a lot to do with getting a website to rank well. More than anything, our study seemed to indicate that Google’s algorithm updates are forcing internet marketers to do the types of things that “real marketers” should be doing. 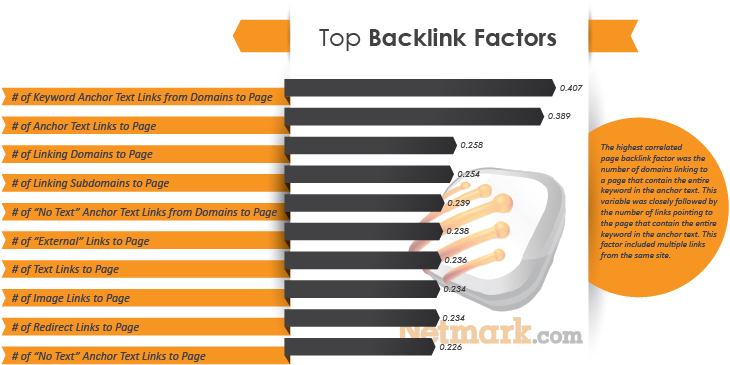 The highest correlated page backlink factor was the number of domains linking to a page that contain the entire keyword in the anchor text. This variable was closely followed by the number of links pointing to the page that contain the entire keyword in the anchor text. This factor included multiple links from the same site. On-page factors accounted for 421 of the 491 explanatory variables used in our study. This number is astounding when you consider that only 34 made it to the final results, meaning most of the correlation coefficients we calculated were not statistically significant. Overall, it appears that on-page factors have a much lower correlation with Google’s search engine rankings than do off-page factors. The biggest surprise in this segment (and one that made us check our work a dozen times) was the positive correlation we found when the keyword being searched was discovered in the ranking page’s meta keywords tag. We plan to follow up more on this finding with a more in-depth analysis later. As discussed in the introduction, our team wanted to look for variances in the correlations we found by segmenting our data into several logical groups. By validating this suspected variability, we could easily justify more in-depth studies, which hopefully result in a much better understanding of how the Google algorithm, or algorithms, are employed. 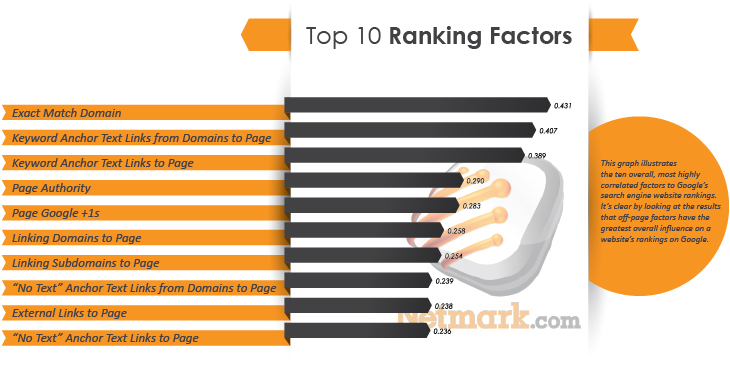 In contrast to the correlations on the domain level, the page level correlations exhibited the shape we expected to see in terms of a graduated scale based on the traffic of the keyword. What does this mean? We have some interesting theories as to what is causing this phenomenon, but we’ll save that for a future paper. For several years it’s been our belief that Google utilizes several filters to detect both web pages and websites with unnatural backlink and social media profiles. One of the easiest ways to find these unnatural results is by ratio analysis and probability distribution. Since our study already gave us all the information we needed to do our own ratio analysis, we decided to explore this area, and compare those ratios to Google’s search engine results. What we found was very interesting. The graphs below illustrate the correlations of various ratios to Google’s search engine rankings. In each graph we used the title of each as the denominator for each ratio and the individual variables below as the numerators. 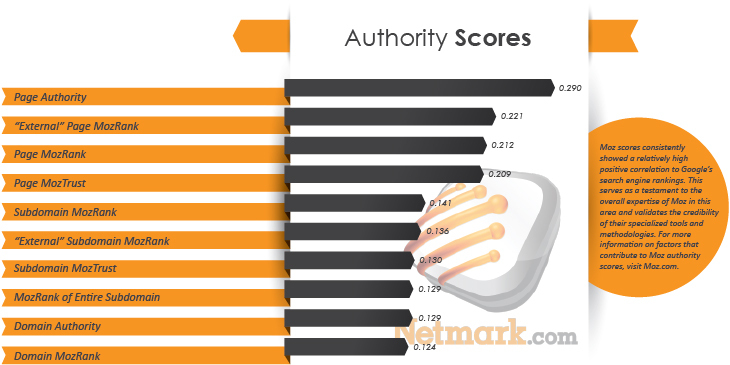 For example, for the variable “# of Page Facebook Likes” in the first graph, we computed: “# of Page Facebook Likes” / “Page Authority” first. Next, we used our resulting ratios to calculate a correlation with Google’s search engine rankings. 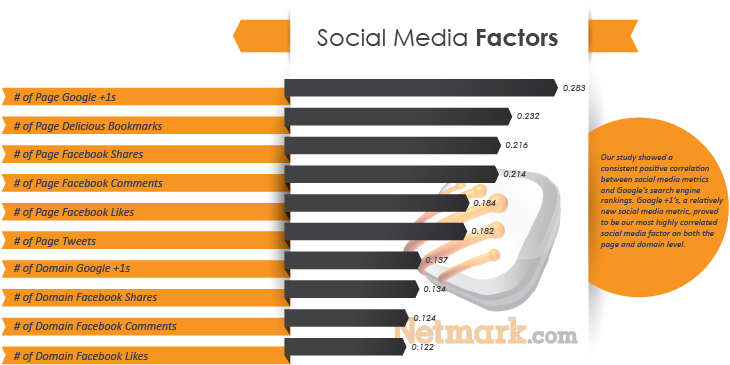 Because previous studies on Google’s ranking algorithm have not concluded whether or not social media metrics are causal, we initially expected smaller correlations using “Facebook Shares” as our denominator. 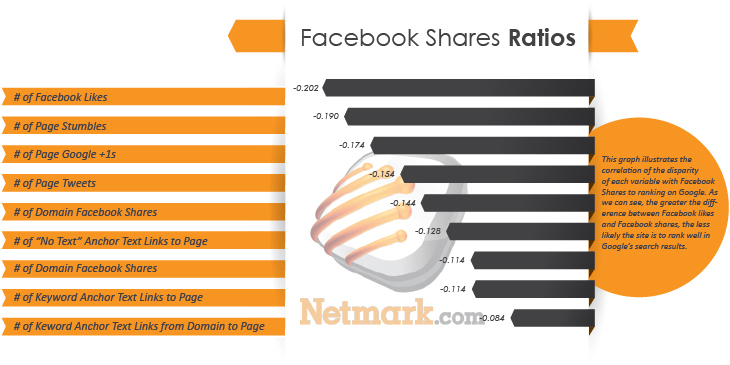 What’s even more interesting is the disparity between “Facebook likes” and “Facebook shares.” In the last graph, we found this ratio to be the most negatively correlated ratio with Google’s search engine rankings. 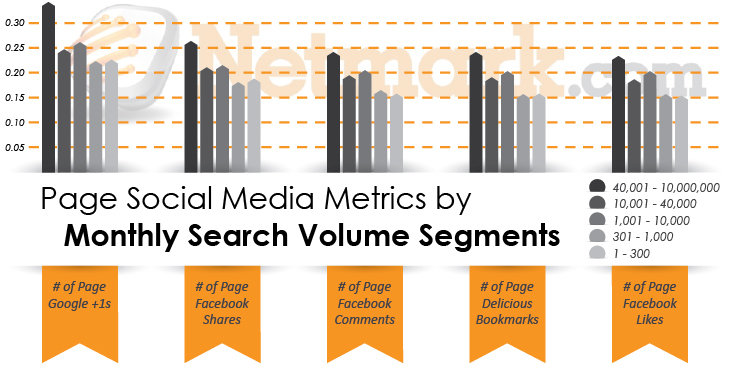 This result seems to indicate that certain social media factors may be more than just correlated with Google’s search rankings. You decide.